The deployment guide includes links for viewing and launching AWS CloudFormation templates that automate the deployment. This reference deployment is part of a set of compliance Quick Starts, which provide security-focused, standardized architecture solutions to help Managed Service Providers (MSPs), cloud provisioning teams, developers, integrators, and information security teams adhere to strict security, compliance, and risk management controls. For additional Quick Starts in this category, see the Quick Start catalog. The following links are for your convenience. The launch button runs the main Quick Start template, which sets up a multi-tier, Linux-based web application using nested templates. For descriptions of the templates included in this Quick Start and information about using the nested templates separately, see the Templates Used in This Quick Start section of this guide. If you have an AWS account that already meets the technical requirements for the NIST deployment, you can launch the Quick Start to build the architecture shown in Figure 2. The template is launched in the US East (N. Virginia) by default. If you have an AWS GovCloud (US-West) account, you can launch the template in the AWS GovCloud (US-West) Region. The deployment takes approximately 30 minutes. If you’re new to AWS or to NIST-compliant architectures on AWS, please read the overview and follow the detailed pre-deployment and deployment steps described in this guide. 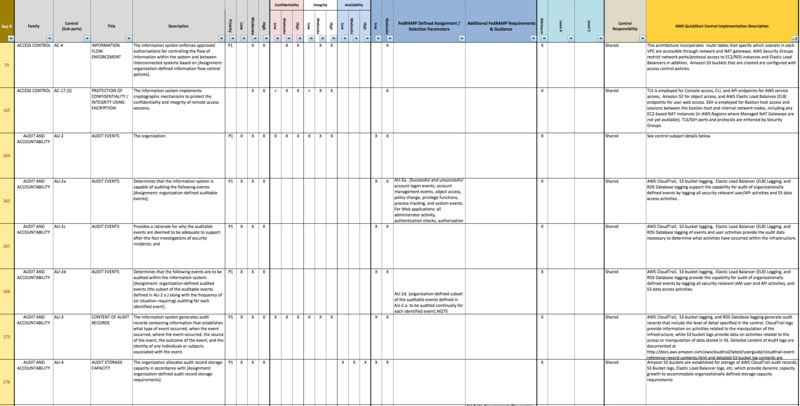 You can also view the security controls matrix (Microsoft Excel spreadsheet), which maps the architecture decisions, components, and configuration in this Quick Start to security requirements within NIST, TIC, and DoD Cloud SRG publications; indicates which AWS CloudFormation templates and stacks affect the controls implementation; and specifies the associated AWS resources within the templates and stacks. The excerpt in Figure 1 provides a sample of the available information.